You and your friend go to a restaurant and enjoy a delicious meal. The two of you appreciate being able to spend time together and have a nice night, but the waiter makes the meal slightly less enjoyable with their rude service and demeanor. When you look back on the experience later, what you remember most is how rude the waiter was. This negative association shapes your entire view of the evening. Your friend however, doesn’t remember the waiter at all. They only remember how tasty the food was and how much they enjoyed the restaurant’s ambiance. When it comes to memory and perceiving experiences, there is no correct version. The version you view as truthful is the one you remember most vividly. The meaning we attach to an experience is often more important than the experience itself. Numerous people can experience the same thing and attach a completely different meaning to it. And as we go through life, we attach meaning to everything. Those meanings turn into emotions, and ultimately, those emotions frame the life we live. Do you want to be someone who lets negative thoughts and feelings dominate their emotional memory, or do you want to learn to reframe these situations in a more positive way? 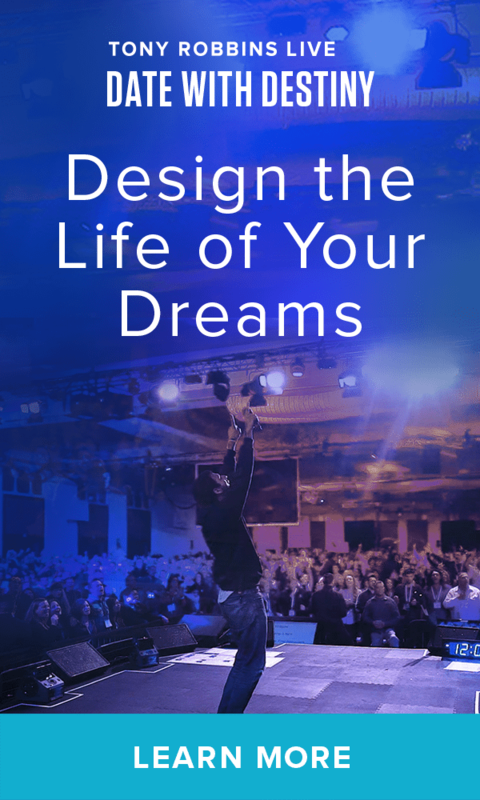 At Date with Destiny, a six-day event live with Tony Robbins, you’ll embark on a journey to identify the values and beliefs that you cherish most and how those values and beliefs define the meaning you give to different situations. More importantly, you will then learn how to shift your values and beliefs and change the meaning you give negative situations, so you can design a life of positivity and fulfillment even during high-stress situations that you may face. In any situation, a negative and a positive can be found. You can get a raise at work, go home and have an amazing meal with your family, and still go to bed angry thinking about someone who cut you off in traffic during your morning commute. There are other people who can have a terrible day—they spill their coffee all over themselves on their way to work, find out their company is laying people off and then discover they need to work late, meaning they’ll miss their kids soccer game that evening. And yet, despite the events throughout their day, when they crawl into bed at night, they think of how grateful they are to have a beautiful home and family. They focus on the positive things, like the great podcast episode they listened to on their morning commute and the nice talk they enjoyed with their spouse before bed. You always have the choice to focus on two things: the good or the bad. Which one will you choose? Regardless of what happens to you, you have to accept that you are the meaning maker of your story. Your meanings create your emotions, and your emotions shape your life. Lately, your sense of making meaning has been on autopilot. You’re taking things for granted. You’re dwelling on the negative. Over time, this will lead you down a bad path. The more you give into negative meanings, the more negative you’ll feel in general. It’s time to take responsibility for the story you’re telling yourself. Break out of the trance you’ve been in and actively choose to feel a different way. Seek new meaning from everyday events. When faced with a negative emotion, acknowledge it and decide to move on. Develop a positive meaning instead and decide to look for the good in every situation. You don’t have to let negative feelings stack upon themselves until you reach your breaking point; you can choose to be happy and focus on the good instead. What is it that drives you? Every action you take and every emotion you let yourself feel go into shaping your life. At the end of the day, what is it that you want? Do you want to feel triumphant? Do you want to be successful in all that you do? Date with Destiny will help you to recognize your true purpose. The powerful six-day event helps you to knock down the walls you’ve built up over time in order to pursue something truly extraordinary. You can’t achieve your ultimate goal if you’re letting your emotions dictate your life. If you’re constantly assigning negative meaning to everything that happens to you, you won’t be able to grow because you’ll be stuck in a place of feeling bogged down and angry. When you identify and then embrace your purpose, you’ll start designing a life in which all your actions are aligned to help you achieve your goal — including your emotions. Date with Destiny will give you the tools needed to assess your emotions. Once you can recognize the type of meaning you’re assigning to your feelings, you can change your life. Not only will changing the way you give meaning to events make you more joyful, but as you work toward following your true purpose, you’ll feel more fulfilled as well. Sign up for the life-changing event today and prepare to reshape your story.